The Portland State Library Update for Spring 2015 is now available in PDXScholar. 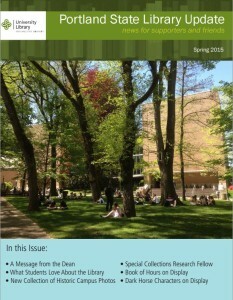 The newsletter was designed by PSU graduate student Emily Goldman. Thanks to Emily Goldman, Stephanie Doig, Anne Keech, and Nichole Perry in Library Administration for help with logistics and mailing. The newsletter is edited by Communications and Outreach Librarian Joan Petit. See the Portland State Library Update collection in PDXScholar.